What is the Azores Weather Like? The Azores Weather is best described as moderate. It is rarely too hot, and never anywhere near freezing. Usually it is just right. Nice and comfortable. In fact, My dad never saw snow until he immigrated to Canada as a teenager! Are you looking for a tropical destination with a guaranteed heat wave? Don’t go to the Azores if that describes you! The islands are much more northerly in the Atlantic Ocean than you might think ( click here to see the Azores Location ). So if your only goal is to lie on the beach, you might be disappointed. But does it get hot? Are there Azores Beaches? Yes, there are lots of beaches in the Azores, and there are hot days. I have been there a couple of times when it was too hot (well almost too hot) and I looked forward to my daily dip in the ocean. The hot weather usually happens in June through to early September when the average temperature is between 17 and 25 Celsius (63 and 77 Fahrenheit). Don’t let that average fool you, it can (does) get quite a bit hotter on many summer days. These are also the months were it rains more (feeding the lush vegetation). The first time I took my wife (Marcia) there was the month of March and it was rainy and cloudy most of that trip. She loves lounging on the beach on a hot day so this first trip was a bit of a disappointment for her (her second trip was in August and she had a fantastic time since it was hot, hot, hot). 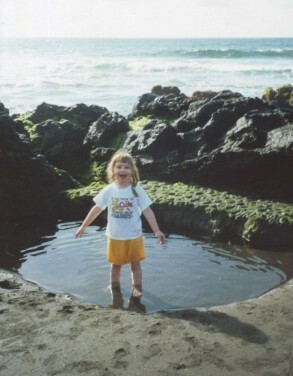 The first time I took my daughter to the Azores it was February and we had many days in the 20’s (Celsius). As you can see by the following pictures the temperature was warm enough to splash in the water (and the water is always warm thanks to the Gulf Stream). 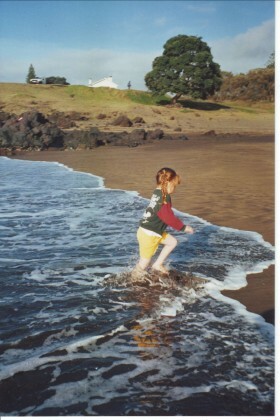 (above) Mandy, my daughter, enjoyed splashing between these rocks on the beach . (below)Mandy loved running in towards the waves and then running away. This February day was in the mid 20’s Celsius (70’s F) and the water was quite warm. The Azores Weather is a bit mixed during the rest of the year (April, May, and October). One day is warm and sunny, the next is day cool, but comfortable. On any given day you might have a real mix of weather, a bit of rain and a bit of sun. If you are like us and love the beach, make sure you go in the summer months (June – August) to ensure that you have some lazy beach days to enjoy. If that is not your primary motive then just about any month will be very comfortable to travel in. I personally find that the climate in the Azores is just right! Click here to return to Magical Azores Islands home (leave about the Azores Weather page). PS ... did you notice my daughters shirt? It says "If you think I'm cute, you should see my daddy". I think I should find her a shirt like that now. She is now a teen and I am sure will roll her eyes when she see's this!